This is a re-posting of a post I wrote back in 2010. I have recently updated the accompanying template. I welcome your feedback. I am working on a large, complex program with many moving parts. Most of the work will be done by volunteers which makes it especially important that each piece of work be clearly identified and defined. 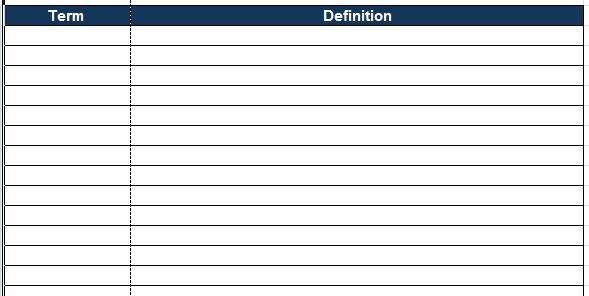 In order to make our WBS clear and concise, we are adding a Work Breakdown Structure Dictionary. What is a Work Breakdown Structure Dictionary? The Work Breakdown Structure Dictionary (WBSD) provides a complete description of each of the work products, services, or work elements to be accomplished during the program. The WBSD document translates the customers requirements into a definition of work to be completed. Why do I need a Work Breakdown Structure Dictionary? For more complex projects a WBSD assists by defining terms, clarifying the work, reducing rework, and providing quality criteria. I researched templates to use and determined that I would create my own excel template using the common elements I found in those templates. I have attached a copy of my template below. It has 2 tabs. The first tab is intended to list and define project terms. Since many of our volunteers do not have previous project experience, they can use this as a reference to terms used on the project. The second table is the WBSD. Please review the template, take it out for a spin and give me your feedback. I will update you on how it works for our program. As with all templates, you should edit the template to fit the needs of your team and project. The Work Breakdown Structure in Government Contracting, by Gregory T. Haugan, Management Concepts, 2003.